Given the strength of the scientific evidence that the world is rapidly heading to a climate catastrophe, it is vitally important to ask what has gone so terribly wrong with the world’s political response to climate change. Understanding the cause of the utterly irresponsible and tragic political inaction on climate change provides some hope for changing course. A a new well-written book by Paul Harris, What is Wrong with Climate Politics and How to Fix It, examines the failure of the global community to reduce the civilization challenging threat of human-induced warming. This book is an excellent, easily understood review of the sorry status of international cooperation to find a global solution to climate change. The book is valuable for its contribution to the growing literature on climate change policy particularly in regard to its clear description of the sorry history of international climate negotiations. The main thesis of the book is that the international focus in these negotiations on the obligations of nation states, rather than on individual responsibility, is a major cause of what has gone wrong. The book makes a compelling case that the almost exclusive national focus of climate change negotiations is problematic for two reasons. First, nations have historically always engaged in international problems from the standpoint of national interest rather than global obligations. Second, from the initiation of the climate negotiations, the international community has assumed that national responsibility will be apportioned largely according to two broad categories, namely developed and developing countries. This categorization is problematic because this classification into these two categories arguably made some limited sense when the United Nations Framework Convention on Climate Change was opened for ratification in 1992, but it doesn’t now given that some of the countries that were initially classified as developing countries, including India and China, are quickly emerging as the among the largest emitters of greenhouse gases (ghg). In addition, in almost all developing countries there is a growing middle and affluent class of high consumers. If developing nations understand that they have no responsibility to curb high consumption of their affluent citizens in regard to ghg, there is absolutely no hope for reducing global emissions to levels necessary to prevent catastrophic warming. In addition, if high emitting consumers in developing nations assume that the duty to reduce ghg emissions is solely a national obligation, not a personal one, they will more likely continue to emit ghgs at high levels without being haunted by ethical or moral failure. And so, Harris compellingly explains why a reliance on national responsibility alone in the global search for an adequate response to climate change will likely guarantee continuing international failure to reduce the enormous threat of climate change. The book also reviews in some detail the mostly dysfunctional role that the United States and China have played in international negotiations for over two decades while at the same time describing the centrality of these two countries in maintaining hope for a global climate change solution. Harris also provides strategies for changing the world’s response to climate change so that citizens around the world understand that they have individual responsibility. The first recommendation is to expand the use of a “human-rights” approach to policies on climate change. Implicit in this strategy is the idea that if individuals understand that they are responsible for human rights violations, they may take their obligations to reduce their gig emissions more seriously. There is little doubt that climate change is already preventing many people around the world from enjoying a host of human rights, a phenomenon that is sure to grow in the years ahead. Furthermore there are several practical reasons why an increased emphasis on human rights has considerable potential utility for improving the international response to climate change. One is that a greater understanding of climate change as a human rights problem should lead to more widespread rejection of many justifications for non-action on climate change. For instance, some of the excuses often used to justify non-action on climate change by nations and others, such as it is not in their economic interest to adopt climate policies, are widely understood to be irrelevant to affecting human rights obligations. However, although turning up the volume on the human rights significance of climate change is something that should undoutably be encouraged, it is not clear why an increased focus on human rights is likely to achieve a greater acceptance of individual responsibility. In fact, human-rights obligations are currently understood to be the responsibility of nations, not individuals, under existing international law. Thus non-state actors, including businesses, currently have no or very limited obligations under human rights regimes. And so, although it is unquestionably true that a greater emphasis on human rights in climate change policy disputes has practical value, it is not clear how this will lead to the shift to a focus on individual responsibility appropriately called for by Harris. Harris’s second strategy to achieve the needed shift to individual responsibility is a public movement to get individuals to understand that current unsustainable consumption patterns are disastrous. According to Harris, it is the unquestioned assumed benefits of the economic growth model that dominates the world that is a major cause of irresponsible consumption generating more and more ghg emissions. On this issue, Harris is undoubtably correct that an economic growth model that is oblivious to the environmental destruction that it is causing is dominating international relations. What is not clear, however, is why a call for change in the growth model by itself will likely undermine the dominant discourse. A deeper understanding of the sociological forces that enable the current dominant capitalist development model to dominate international affairs is likely necessary to develop an effective strategy to dislodge this discourse. In addition some explanation is necessary for why some developed nations (most of whom are in Northern Europe) have taken climate change more seriously than others if the problem is the international dominance of the economic growth model. In this regard, Harris’s analysis leaves something of great importance off the table. Harris almost completely ignores the role that economically interested corporations and free-market fundamentalists foundations have had in undermining climate change policies in the United States for over two decades. As we have written about many times, there has been a huge, well-organized, well-funded climate change disinformation campaign that is largely responsiblse for the failure of the United States to take climate change seriously. See, for instance: The Climate Change Disinformation Campaign: What Kind Of Crime Against Humanity, Tort, Human Rights Violation, Malfeasance, Transgression, Villainy, Or Wrongdoing Is It? Part Two: Is The Disinformation Campaign a Human Rights Violation Or A Special Kind of Malfeasance, Transgression, Villainy, Or Wrongdoing ? and The Climate Change Disinformation Campaign: What Kind Of Crime Against Humanity, Tort, Human Rights Violation, Malfeasance, Transgression, Villainy, Or Wrongdoing Is It? Part One: Is The Disinformation Campaign a Crime Against Humanity or A Civil Tort? This campaign, through the use of sophisticated public-relations honed tactics, has successfully prevented political action on climate change in the United States for over two decades. It also has had some effect on the the United Kingdom and Australia but much less so in some other developed countries. Therefore, the two strategies recommended by Harris to shift global understanding about who has duties to reduce ghg toward individual responsibility will likely not be successful without a direct, dramatic, and vigorous confrontation with the climate change disinformation campaign. In fact, as we have argued before in considerable detail, this climate change disinformation campaign should be understood as some new kind of crime against humanity. The other failure not discussed by Harris worthy of considerable attention is the failure of the media in many parts of the world to report on several aspects of climate change that need to be understood to fully understand personal and national responsibility. They include, the nature of the scientific consensus position, the civilization challenge entailed by the quantity of emissions reduction necessary to stabilize ghg in the atmosphere at levels that will avoid dangerous climate change, the fact that one can not think about national or individual responsibility clearly without considering equity and justice questions, and the utter ethical bankruptcy of the scientific and economic justifications for non-action on climate change that have been the dominant excuses for non-action on climate change for 35 years. At least in the United States, the media has dramatically failed to help citizens understand these crucial features of climate change. There is no doubt that Harris’s call for a shift to individual responsibility and away from national obligations alone is worthy of serious and expanded reflection. 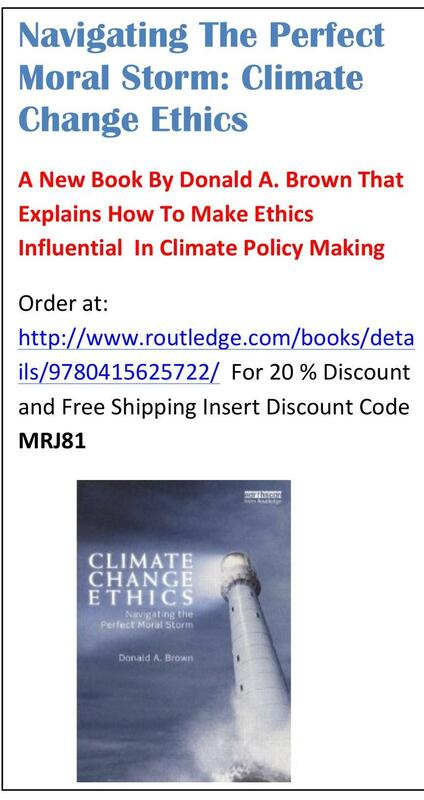 Therefore the book is recommended for anyone engaged seriously in climate change policy issues. However, to think strategically about how to generate a greater awareness of individual ethical responsibility, Harris’s book should be supplemented by additional strategic considerations. We have attempted to explain some of these considerations in the recent book: Climate Change Ethics: Navigating the Perfect Moral Storm. This entry was posted in Atmospheric Targets, climate change ethics, climate change policy-making, climate ethics, disinformation campaign (see also climate change disinformation), Duties of Heads of State, Economics and Climate Change, Economics and Cost, equity and climate change, ethics of climate change, General Climate Ethics, global warming ethics and tagged barriers to climate change policy, China and climate change, climate change and morality, climate change deniers, climate change ethics, climate change negotiatons, climate change policy, climate ethics, Ethics and Climate Change, Ethics and Global Warming, ethics of global warming, global warming ethics, Individual responsibility for climate change, national responsibility for climate change, Poltics and Cllmate Change, UA and china on climate change, US ethical responsibility for climate change., US media failure on climate change, US response to climate change by dabrown57. Bookmark the permalink.